f there's one thing sports fans are talking about today, it's yesterday's New England-Denver NFL game. Why? Well, because it was an important game...Denver moved to 5-0 and dropped the out-of-sync Pats to 3-2, further dampening the Boston sports scene on the same day on which the Red Sox got booted from the playoffs by the California Angels of Anaheim at Los Angeles Angels of California at Anaheim. Or whatever they're called now. But what really has fans talking today isn't so much the game itself as it is the sartorial implications of the throwback AFL uniforms both teams--particularly Denver--wore in honor of the 50th anniversary of the rebel football league that took on the NFL and actually managed to infiltrate it. Consensus seems to be that the vintage 1960 Broncos throwbacks were hideous, but, as you might imagine, I actually liked them. The gold jerseys were arresting, and the striped socks and stripes down the pants made many of the players--even some of the linemen--look taller and sleeker than they probably are. Credit to Denver, too, for going all out for this one--the end zones at whatever Mile High Stadium is called now had traditional diamond designs painted in them, and at one point CBS pointed its camera to a Broncos PR official who was decked out in a brown and yellow suit and hat straight from 1960s. Righteous. The only problem with the game, of course, is that the Pats lost. But, although New England-Denver was the fashion and football highlight game from the NFL yesterday, the one that intrigued me most was Dallas-Kansas City. Of course, as a lifelong Cowboys fan, I'm always interested in what the Cowboys are doing--even if I can't stand Jerry Jones and get a sick feeling in the pit of my stomach when I see that Arkansas carpetbagger celebrating a victory. There was a lot more to yesterday's game for me than just interest in seeing the Cowboys play, however. When I was a small child, I remember being at someone's house--I don't remember whose--with my parents and seeing painted footballs (the kind a player gets when he earns a game ball) with the words "Dallas Texans" on them. Now, I don't think we were in the home of a former Texans player, so I don't know where the footballs came from. But I do remember asking my dad who on earth these Dallas Texans were. He explained to me that the Texans had been part of the old American Football League and that they had moved to Kansas City for the 1963 season after three seasons in Dallas. Founded by prominent Dallasite Lamar Hunt, the Texans had started playing in the Cotton Bowl in 1960...the same year the Cowboys occupied that stadium for their first season. Over the years, while watching football or just chatting about it, my dad would tell me stories of the old Texans. Legendary coach Hank Stram led an entertaining team with a high-flying offense. Interestingly, many of the Texans were actual Texans--TCU's own Jack Spikes and Sherrill Headrick starred for the team, as did--in 1960, anyway--Cotton Davidson, a quarterback from Baylor. And then there was a young man from what is now the University of North Texas, the school my dad was attending the year the Texans won the big game in Houston. The man's name was Abner Haynes, and he was a former North Texas star and--for my dad, anyway--one of the all-time greats. Abner Haynes was an African-American star in an era before the old Southwest Conference (Texas's showcase college conference of the era) was integrated. North Texas integrated long before most schools in Texas and the South, so Haynes became a big-time player for the Eagles in the '50s and then went on to become a popular Texan. Many were the times when Dad would tell me about Abner waiting for a kickoff--back when the goal posts were still on the goal line--by leaning back on a goal post with one foot resting on it behind him. Then, Abner would sprint forward, catch the ball, and launch a long and electrifying kickoff return. I'm probably still one of the few football fans younger than 60 who knows who Abner Haynes is; I'm surely one of the very few who knows of his exploits with the Texans. Given my soft spot for all things Kansas City--my father-in-law's family hails from there, and my wife herself went to high school in Manhattan, Kansas--and given that the Chiefs were wearing, surely for the first time anybody has since 1962, the uniform of my dad's original favorite pro football team, I was honestly a little torn about which team I wanted to win the game. I was somehow happy when the game ended in a tie after regulation--and even happier when the Cowboys won in overtime (until I saw Jerry Jones celebrating on TV, and that sick feeling came back again). What made me happiest, though, was that the Dallas Texans, long gone and mostly forgotten, were getting a little recognition on the NFL stage. The old AFL has left a massive and lasting legacy on pro football, as evidenced by the AFL franchises that still exist in the NFL today and the success many of them have had. The AFL actually cracked the NFL's hierarchy by merging with the old-line league--but not before famously pulling two consecutive upsets in Super Bowls III and IV, which were played back when the leagues were still separate entities. Lamar Hunt was the driving force behind the AFL, and it's a shame that he didn't live long enough to see Sunday's game. According to an excellent article in the Kansas City Star, Hunt always wanted the Texans to face the Cowboys and was convinced that he had the better team. (And, in the early '60s, he might have, despite the fact that the AFL was mostly a league for NFL castoffs, or so the experts said.) The Texans' attendance was on par with that of the Cowboys in the early '60s; the team had a following, but its future was never going to be in the Lone Star State. Dallas would belong to a great man, Tom Landry, and his Cowboys. Of course, Hunt's Texans-Cowboys Cotton Bowl showdown never happened, and Hunt took his franchise to KC--where, it's worth noting, it won a Super Bowl two years before the Cowboys claimed their first Super Bowl title. (Of course, the Cowboys now have five to their name, and the Chiefs still have only one. But still...) As the Star article notes, it's funny that the game ended in a tie after regulation yesterday--because, in 1960, there was no overtime for regular-season games. The Texans and Cowboys, meeting at last (sort of), played yesterday to a dead heat. And then, perhaps appropriately, the Cowboys just pipped the old Texans in overtime. 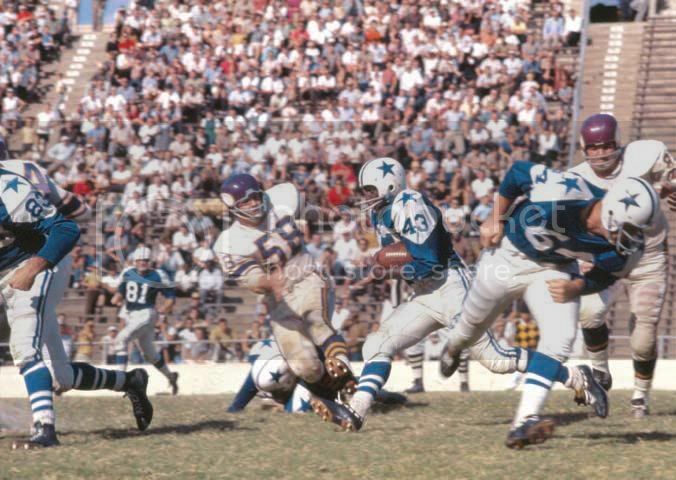 But, best of all, I got to get a tiny little taste of what it was like to see Dallas's "other" team play, the star-studded champion that time forgot and that left Dallas in the hands of a legendary franchise. Sure, it was the Chiefs playing in hi-def in KC and not the Texans playing in black and white in the Cotton Bowl, but I felt a certain bond with my dad nonetheless. I got so excited, in fact, that I went out last night and sponsored Abner Haynes's page at ProFootballReference.com in honor of my dad. It's a small gesture, and maybe a strange one at that, but I feel as though by keeping Abner's stats alive, I'm helping to preserve the legacy of a man, a team and a league I don't remember but have always wished I could have known.